Two themes that normally don’t intersect in true films come together surprisingly well in this simple documentary: history and the last five minutes. 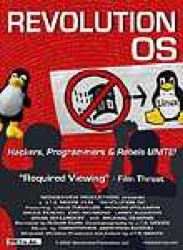 Revolution OS explores the significance of trendy open-source software by going deep into its short history, acting as if open-source technology was a world-changing event of such magnitude that everyone will someday demand to know how it began. Which they probably will. Here is the film they will show later this century. The stress in on the political, not the technical. No drama, either; just clean geek history of a big idea when it started out small.